Lua error in Module:Location_map at line 488: Unable to find the specified location map definition: "Module:Location map/data/Virginia" does not exist. The Pentagon is the headquarters of the United States Department of Defense. It is in Arlington, Virginia (near Washington, D.C.). It has limestone walls. It is in the shape of a pentagon. It has seven floors. There are 23,000 people working in it. The Pentagon is the biggest office building in the world, but any place in the building can be reached within 7 minutes. They began building it on September 11, 1941. Exactly sixty years later, on September 11, 2001, it was hit with an airplane by terrorists. One hundred eighty-nine people in the building were killed. The Pentagon has the most floor area of any building in the world. It has a total floor area of 6,500,000 sq ft (604,000 m2). Offices are 3,700,000 sq ft (344,000 m2). Approximately 23,000 military and civilian employees and about 3,000 non-defense support personnel work in the Pentagon. It has five sides, five floors above ground, two basement levels, and five ring corridors per floor with a total of 17.5 mi (28.2 km) of corridors. The Pentagon includes a five-acre (20,000 m2) central plaza, which is shaped like a pentagon. The concentric rings are named (from the center out) as "A" through "E" (with in addition "F" and "G" in the basement). "E" Ring offices are the only ones with outside views and are generally occupied by senior officials. Office numbers go clockwise around each of the rings, and have two parts: a nearest-corridor number (1 to 10) followed by a bay number (00 to 99), so office numbers range from 100 to 1099. These corridors radiate out from the central courtyard, with corridor 1 beginning with the Concourse's south end. Each numbered radial corridor intersects with the corresponding numbered group of offices (for example, corridor 5 divides the 500 series office block). There are a number of historical displays in the building, particularly in the "A" and "E" rings. Floors in the Pentagon are lettered "B" for Basement and "M" for Mezzanine, both of which are below ground level. The concourse is located on the second floor at the metro entrance. Above ground floors are numbered 1 to 5. Room numbers are given as the floor, concentric ring, and office number (which is in turn the nearest corridor number followed by the bay number). So, office 2B315 is on the second floor, B ring, and nearest to corridor 3 (between corridors 2 and 3). One way to get to this office would be to go to the second floor, get to the A (innermost) ring, go to and take corridor 3, and then turn left on ring B to get to bay 15. A person can walk between any two points in less than seven minutes. 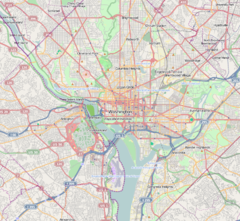 Just south of the Pentagon are Pentagon City and Crystal City, extensive shopping and high-density residential districts in Arlington. Arlington National Cemetery is to the north. The Washington Metro Pentagon station is also located at the Pentagon, on the Blue and Yellow Lines. The Pentagon is surrounded by the complex Pentagon road network. Every day, thousands of commuters traveling between Arlington, Virginia and Washington, DC drive on the roads of the Pentagon Reservation. The Pentagon Athletic Center (PAC) is a fitness center for military and civilian staff. It opened in a separate building on the north side of the Pentagon in 2004. Each year, the Pentagon grounds hold the Marine Corps Marathon and the Army Ten-Miler running events. The public may take a 60 minute long tour of the building. Tourists also visit the Pentagon Memorial that is on the building's west side. ↑ "Facts: Navigating The Pentagon". pentagontours.osd.mil. Retrieved 10 January 2018. ↑ "Virginia Landmarks Register". Virginia Department of Historic Resources. Retrieved May 12, 2013. ↑ "The Pentagon - George Bergstrom - Great Buildings Online". Greatbuildings.com. Retrieved 2008-10-26. ↑ 7.0 7.1 7.2 7.3 "Pentagon Facts & Figures". Department of Defense. Retrieved August 18, 2011. ↑ "How to Find a Room in the Pentagon". Headquarters, Dept. of the Army. Retrieved September 13, 2007. ↑ "Man shoots 2 officers outside Pentagon". CNN. March 5, 2010. Retrieved May 25, 2010. ↑ "Mixing Bowl Interchange Complex". roadstothefuture.com. Retrieved November 22, 2006. ↑ "Pentagon Renovation Program". Archived from the original on 17 June 2008. ↑ "The Pentagon Tours Home Page". Department of Defense. Retrieved August 18, 2011. ↑ "The Pentagon Memorial". Washington Headquarters Services. Retrieved August 18, 2011. This page was last changed on 11 April 2019, at 16:05.